The Ace & Jig Teasdale Dress in Ivy (size XS shown) is one of my favorite dresses this season, and one of the dresses I knew I needed to buy as soon as lookbook photos started coming out. A favorite style and textile combo doesn't always happen for me (where is the Soleil Surf/Cliff/Teasdale I desperately need in my life? ), so I'm very glad this one exists! 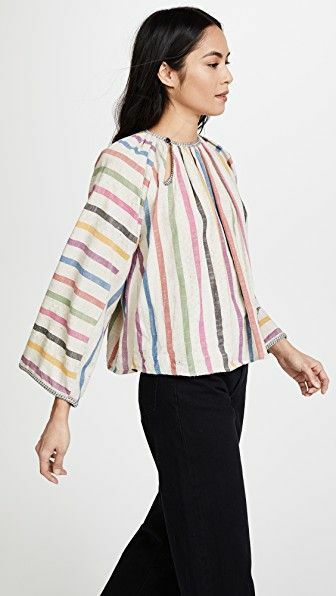 I've been wearing mine constantly this season, as the slightly weighty and textured fabric feel nice and cozy while still being breezy due to the loose cut, and the color combo is so unique and unexpectedly great. Many have compared this to the Ace & Jig Shore Dress style from many seasons ago, and though they look quite similar, the fit of the Teasdale is far better for me, as the straps on the Teasdale are better proportioned, and I found the Shore Dress to fit too large to size, even in size XS. Size/Fit: True to size for me. The Teasdale Dress in general seems to vary greatly in size across textiles. I had previously mentioned that the Teasdale in Merry seemed to run a bit small for Ace, and I still think that's the case. On the other hand, the Teasdale in Saki runs quite large, as I nearly drowning in size small I own in that textile,while I could potentially size up in either Merry or Ivy if I needed to. This style seems to best flatter petites and those with smaller chests due to the height of the waistline, which ends up falling around the natural waist for me. Those with ampler bosoms might find that it has more of an empire-waisted fit for them, which may or may not be desirable. Notables: Turnaround. Can be worn with higher or lower neckline in front. Overall Thoughts: One of my favorite purchases this season! I know some are not fans of the contrast bottom panel, but I really feel like it gives the dress some of its charm. And it's worth noting that you can reverse that bottom panel (a la @feynman_sews) if you so choose with some sewing skills or the help of a tailor. Have you tried the Teasdale Dress in any textiles? What do you think? Let me know in the comments or by pointing me to your post about it, and I'll be sure to link you!